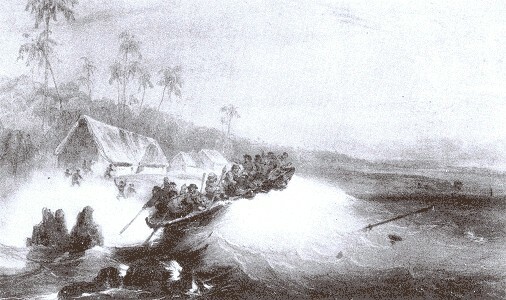 Surfring at Kealakeakua, Hawaii, 1836. Unless Haste is Made: A French Skeptic's Account of the Sandwich Islands in 1836. Illustrated by Barthelme Lauvergune and Theodore Auguste Fisquet. Press Pacifica, Kailua, Hawaii, 1978. Penny Pagliaro (Editor), Daniel Dole (Translator). Originally published in French in 1839. A5- "Les Iles Sandwich" Revue des deux mondes, Aug. 1, 15, 1839. 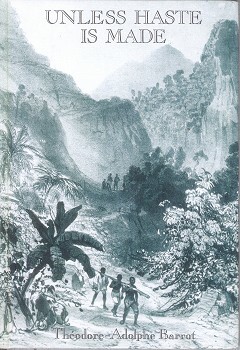 French magazine with text of his visit to the Sandwich Islands in 1836. A6- "Visit of the French Sloop of War Bonite, to the Sandwich Islands, in 1836"
The Friend, Serialized Jan.-Nov., 1850. Running Aground in the Sandwich Islands. 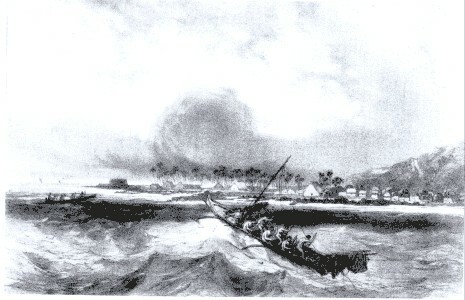 Leaving Guayaquil, August 14th, 1836, we came in sight of Hawaii in the night of September 29th. From early morning we looked with impatience, in the direction where we supposed the island would appear. According to the accounts of navigators, we ought, at a great distance, to perceive Mauna Loa, the mysterious summit of which had not, for a long time, been visited by any European. It entered into our plans to explore its almost inaccessible gorges, to cross over the snows which crown it, and inscribe our names upon its most elevated peak; this for some days was the almost constant subject of our conversation. The house of Mr. Forbes is in the midst of a garden, which seemed to have been somewhat neglected, and surrounded by a quick-set hedge of ki; the ki is a shrub with large leaves, and its root when cooked has the taste of calomel or burnt sugar. The natives formerly extracted a very strong liquor from it, but at present the missionaries have prohibited, under severe penalties, the distillation of this root. Mr. Forbes received us very cordially, and introduced us to his family, consisting of his wife, a native like himself, of the United States, and two lovely children. Kapiolani joined us and very soon the bell called us to church. On the morrow, I went to visit the village of Kealakeakua, accompanied by M. Eydoux, surgeon of the corvette, and M. Hebert. To land with dry feet was impossible, and we were obliged to swim in some manner in order to reach the shore. This failed not to excite the mirthfulness of the population around us. It is certain that the customs of the country were much better adapted to the occasion than our own. A crowd of boys and girls immediately surrounded us. ... scarcely two miles distant from Kaawaloa, the population of Kealakeakua appeared to be far less under the influence of the missionary. We could perceive this without difficulty in the clothing of the islanders and in their conduct to",,!ards us. Here the maro was the only article of clothing worn by the men, and scarcely were the women better clad. But the manner in which the women received us proved beyond a doubt, that their actions were not so immediately under the control of Mr. and Mrs. Forbes as those of the inhabitants of Kaawaloa. They employed every possible art to attract our attention and to win our favor; but it is true that the rings and necklaces distributed by these gentlemen to the prettiest, were not without influence upon their friendly dispositions. The itch seemed to be a prevailing malady among them, almost all were more or less affected with it. This circumstance, joined to the copper color of their skin and to the sluttishness of their clothing, diminished very much the strength of their attractions. As the men that we had seen up to that time seemed tohave a preference for money and clothing, so the women at Kealakeakua appeared to have preserved the taste for toys noticed by the first navigators. A string of glass beads, a copper ring with a colored stone, filled them with joy. ... the waves which were breaking upon the shore; a plank, six or eight feet in length, and pointed at one end, enabled them to sustain themselves on the crest of the waves. It was indeed, a singular picture- a swarm of young women passing far out to sea, then returning with the swiftness of an arrow, borne upon the foaming crest of the surges which break with the noise of thunder on each side of the bay. The least movement of their body gave to the plank which sustained them, the desired direction, and disappearing for a moment in the midst of the breakers, they very soon arose from the foam and returned at their ease to run the same race again. I saw a mother, who having placed her child, scarcely a year old, upon a plank two feet long, pushed it before her to a great distance, and then abandoning it to the fury of the waves, she followed, directing only now and then the plank which sustained it. I had expected to see this population such as Capt. Cook found it, free and independent, and the contrast I avow, did not appear to me in favor of the present, when I afterwards saw these women covered with dirty rags. The difficulties we had experienced in landing suggested the idea of returning on board the Bonite in a canoe. the advantages possessed by these light and easily worked canoes in a rough sea over our heavy boats. We entered a canoe of about fifteen feet in length and a foot or more in width. This canoe, like all those of the Pacific islands, had an out-rigger made of a piece of light wood and fixed parallel to the canoe by means of two transverse bars four or five feet in length. Our Indians waited for what is called a calm, that is the moment when the waves which usually succeed one another to the number of four or five, seem to cease for an instant, then they drew the canoe rapidly some distance from the shore, when springing upon their seats and paddling vigorously they were able before the next wave rolled in to gain such a distance that we experienced only two or three strong undulations. We reached the Bonite safe and sound. The next day I spoke to Mr. Forbes concerning the extraordinary dexterity in swimming which I had observed on the preceding day among the natives. "You can have no adequate idea of it," he replied, "they are more at their ease in the water than on the land." To confirm this assertion, he related an adventure which seemed too interesting to be omitted here. The natives in their canoes frequently pass over the channels which separate the different islands of the archipelago. One day, a native accompanied by his wife and two small children, put off in a canoe from the northern point of Lanai with the design of landing on the southern part of Molokai, a distance of seven. or eight leagues. ... fine, but suddenly a dark cloud blackened the sky, a gale commenced and the sea became very rough. For a long time the skill with which the islander guided his frail skiff in the midst of the waves preserved it from being wrecked; but at length a sea broke the out-rigger and the canoe capsized. The children were too young to be able to swim. He seized them at the moment when the sea was about to swallow them up, and placed them upon the canoe, which being made of light wood floated, although bottom up. Then he and his wife swimming at its side, undertook to urge it along to the nearest shore. They were then near the middle of the channel. very strong current which urged them back into the open sea. To struggle against the force of the current would have been to expose themselves to certain death; they therefore decided to direct their canoe towards another part of the island. Yet the night came on and they began to feel cold. she continued to swim near her husband, pushing the canoe before them. Soon the poor children became fatigued for they could not long cling to the round and polished surface of the canoe without a continued effort, and they were also chilled with cold. Soon they relinquished their hold, and fell one after the other, into the sea. ... them again upon the canoe, striving at the same time to encourage them. Alas! their strength was exhausted- their little hands could no longer retain their grasp, and the sea engulfed them for the third time. It was no longer necessary to think of preserving the canoe; the parents therefore took the children upon their backs and swam towards the land which was sarcely visible in the darkness. An hour later, the woman discovered that the child which she was carrying was dead, and she broke forth into bitter lamentations. In vain did her husband persuade her to abandon the child and to take courage, pointing out to her the shore which now seemed near. The unhappy mother would not separate from her lifeless child, and she continued to carry her precious burden until she felt her strength nearly exhausted, when she told her husband that she must die, for she could swim no further; yet, notwithstanding her husband's earnest entreaties, she would not relinquish her burden. He then endeavored to sustain her with one hand and to swim with the other, but nature could not prolong the struggle, and she disappeared beneath the waves. The husband continued to swim on in sadness. The desire to save his surviving child alone sustained him. At length, after many hours of unspeakable hardship, and when almost dead, he reached the shore. His first care was to embrace the son he had saved, for he alone remained to him of his beloved family. ... shore by some fishermen. He revived, but he died soon after in consequence of his sufferings, and perhaps also from grief. He had been in the water eighteen hours. We were at Kealakeakua six days, visiting the natives at their houses and collecting such information as seemed to posess any interest. We were informed that Kapiolani together with Kaahumanu, wife of Kamehameha, was the first to embrace the Christian religion, but her conversion was not very sincere at first. "For twelve years or more," said Mr. Forbes, "she was a very bad woman. She was constantly drunk and she had four or five husbands. Even after having received baptism, she retained two; and it was only in consequence of our expostulations that she came to the conclusion to have but one." At present she is a virtuous woman, and she has become the firmest defender of the moral and religious innovations on Hawaii. Geoff Cater (2010) : Theodore-Adolph Barrot : Surfriding at Kealakeakua, Hawaii, 1836.